The balance of maintaining existing cruise ships and launching new ones, while enhancing the fleet to be as consistent and attractive to travelers across the board, is no doubt a challenging one, but it’s a challenge that cruise lines accept with fervor. The biggest hurdle, however, is making the most of only a few weeks to refurbish an existing ship versus the years dedicated to building a new one. The reality is that there is less of a rush to launch a new ship than there is to bring an existing one back online once in dry-dock, and the reason is simple. Cruise ship capacity can only generate revenue if it is actually sailing, and taking an existing vessel out of service reduces that established potential. A new ship is all gravy and doesn’t deplete the coffers until it is first introduced and later refurbished itself. 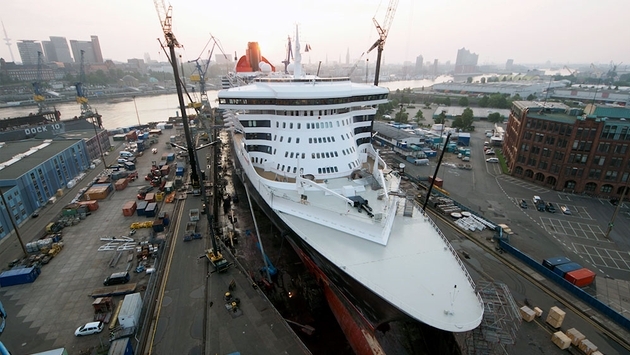 So, while it took Cunard Line a year and a half to first build its flagship Queen Mary 2 (pictured above), for example, the company only had 25 days to recently remaster it. Now to be sure, the superstructure was already in place, saving lots of time over the initial construction, but going through nearly every interior bow to stern to remodel them in less than three weeks is no small task. All in all, the ship came out looking marvelous with a whole slew of improvements, not the least of which was the complete overhaul of the ship’s buffet, requiring the removal of two central elevators no less, and conversion of the Winter Garden into the Carinthia Lounge. Accommodations also received a substantial freshening, even including the liner’s kennels, but it was known from the beginning that the time would not be long enough to enhance all of the entry-level Britannia staterooms, which are set to be finished through the end of the year. That means even when a dry-dock has ended, the work often continues on improvements and certainly always maintaining the ship from regular wear and tear. Redesigns are about the broad strokes with subtleties of refurbishment occurring over time. Without significant fault, some smaller details do get missed in the process like the remaining grungy shower pans, bathroom cabinet pulls and thermostats of the QM2 cabins along with their rust stains in the ceiling, painted over without necessary replacement. Overall one of the best maintained fleets in the industry, the Disney Cruise Line is not entirely immune either as the recently competed Disney Wonder emerged from its 53-day dry-dock with just a few rough edges, namely some veranda light fixture and pool deck overhang rust as well as a sloppy wallpaper transition from the Cove Bar to the new Concierge Lounge. Even a few glued down props from the new “Frozen Adventures” section of the Disney’s Oceaneer Club kids facility were temporarily missing, but only noticeable from adult eye level. Truth is I’ve also seen worse, like from Celebrity Cruises’ Millennium-class ships fresh out of refurbishment, where new deck coating installations and transitions had been rushed with blotchy finishes and old conduit piping not cut perfectly flush to the surface. Inevitably, the point is this: 99.9 percent of the work looks great, and it’s very difficult to catch every little last detail before a ship relaunches. Wrinkles are only pointed out in the hopes that they will soon be ironed out, and they are small enough that they easily can be.